From an outsider’s perspective, being the director of the Australian Museum looks a bit like the cultural equivalent of being the captain of the Australian cricket team. With its rich history as our nation’s oldest museum, it is etched into the consciousness of generations of Sydneysiders and many visitors to the Emerald City. Despite the national name and the New South Wales state government funding, its collecting ambitions across nature and culture extend beyond national and state geographic boundaries. It is the most ‘Australian’ of all Australian Museums. Changes in leadership happen with roughly the same frequency as the sporting analogy above. It is always worthwhile and instructive to visit a cultural institution after there has been a change in leadership. In the past, as a general rule, the larger the institution, the longer the time you should wait before there would be any obvious changes indicative of new leadership thinking. There are usually a host of legacy issues to deal with before a new leader can stamp their distinctive imprimatur onto an organisation. In a fast-paced and rapidly changing world, when instant results are required, perhaps that view is somewhat antiquated. Leadership changes at the Australian Museum have a colourful history. An early director, Gerard Krefft, was carried out of the director’s office, still resolutely occupying the director’s chair, and unceremoniously dumped on William Street on the orders of the Board of Trustees in 1874, amid claim and counterclaim of falsifying records, misuse of public funds and drunkenness. 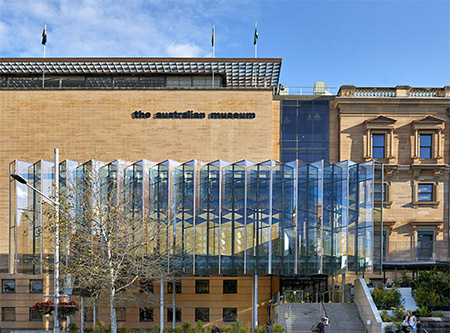 Even though the Australian Museum’s new director was previously a trustee, thankfully the most recent leadership change, about two years ago, was effected without harsh denunciations, physical argy bargy or displacement of furniture. Anyone, however, who heard Kim McKay’s keynote presentation at the 2015 Museums Australia conference at Sydney Town Hall last April was left in no doubt that significant change at the Australian Museum was in the air. According to McKay, the museum will be a platform, akin to a media organisation, to creatively communicate content with ever expanding audiences. There are over 18 million objects in the collections and each one has a story that needs to be told. The changes at the museum will be rapid and Sydneysiders will fall in love with the grand old institution all over again. The first thing to notice when you go to College Street today, looking for the entrance to the building, is that it’s not there. After almost 150 years the entrance has moved around the corner to William Street, where it was originally intended to be. The museum now faces the Botanic Gardens and the harbour rather than Hyde Park and the central business district. While this is not quite a 180-degree turnaround for the organisation, it seems we are half way there. As with the portals to many major cultural institutions, the new entranceway is grand and impressive. The gentle incline towards the entry is engraved with understated, but intriguing, sets of footprints. It turns out they are replicas of footprints left by the First Australians some 20,000 years ago on the shores of Lake Mungo. The prints are from the feet of two adults and a child. Casts of the original footprints, which have been covered over for their protection, are part of the Australian Museum’s collection. They were digitally scanned for this project, representing two very different forms of adaptation, before being incorporated into the entranceway. This piece of visual communication as the visitor approaches the entry is all the more enthralling given the iconography and symbolism of the museum as a colonial institution attempting to draft new organisational meanings in a postcolonial world. If you look closely at the child’s footprints you can almost sense the exhilaration and joy as the plastic mud was squeezed between toes before the ancient sun turned the mud to stone, a unique moment of exhilaration and engagement coded into rock. If this is an indication of how the reoriented museum will extend a public discourse on the relationships between people and their environment, then we have much interesting and exciting work to anticipate. There is some interpretation about the footprints. It seems that one of the adults was a ‘one-legged man’. He was responsible for only a single, right footprint, unlike the multiple prints of the child and other adult. I wondered if the scientists who studied the ancient walkway had additional empirical evidence before drawing the firm conclusion of ‘one-leggedness’ about the solo footprint-maker. Without the interpretation, casual visitors might assume they were simply markings left on a drying concrete slab by the neighbourhood children and start looking for associated mischievous signatures and dates. The child’s footprint trail doesn’t quite make it to the entrance of the museum, which is a bit disturbing, and some cynics have commented that the footprints are pointing the wrong way given the large number of staff departures late last year. 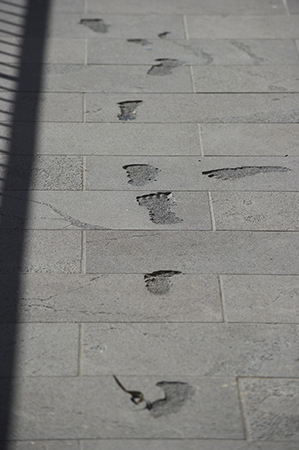 Nevertheless, as a concept, the entranceway footprints speak eloquently about the museum and what it represents. At the top of the slope is Crystal Hall, a new exhibition and event space through which the museum is entered. Early plans of this development illustrated the area bristling with natural history specimens that were to become a visible part of the streetscape. Given the name, I anticipated that some of the more spectacular and beautiful mineral specimens from the Albert Chapman collection, which were previously displayed deep within the galleries of the museum, would be brought front and centre into Crystal Hall. The Chapman collection is as much a story of a collector as it is an accumulation of aesthetically stunning mineral specimens. They were originally part of the collections of the former Geological and Mining Museum at the Rocks. This institution, which was temporarily and mysteriously renamed the ‘Earth Exchange’ in a misguided bid for relevance and grooviness, vanished in 1995 by state government decree after 86 years of continuous operation. Most of its holdings, representing much of the geological heritage of the state of New South Wales, has remained publically inaccessible ever since. Those protesting the imminent removal of the Museum of Applied Arts and Sciences from its site at Ultimo should remember that NSW politicians already have a track record in this area. These are the same politicians who will, in private, bemoan the fact that the Melbourne suite of major cultural institutions has a sense of coherence Sydney just can’t seem to match. Well, it might be a good first step in addressing this anomaly if they were to stop making meretricious decisions about the future of individual institutions. Alas, only four mineral specimens were on display when I visited the Australian Museum, none of them from the Chapman collection. It seems the name Crystal Hall is derived from its façade of angular vertical glass that is punctuated by planar pleats of pink, green and blue pastel-coloured glass imitating crystal faces of rose quartz, peridot and aquamarine. While the Chapman collection is still on display in its original gallery, much else inside has changed. The 1870-era Barnet Wing on the College Street side of the building, which once housed the café and museum shop, is a new ‘permanent’ gallery. It is the site of the permanent exhibition Wild Planet that features over 400 animals, both extant and extinct, and tells the story of global biodiversity. The café is now on the fourth floor of the William Street side of the building, taking in views of the harbour, whereas the museum shop remains on the same level but has moved into the museum’s former temporary exhibition space. Wild Planet and Crystal Hall together formed stage one of the new director’s revitalisation plans. Wild Planet was also an opportunity to rethink the use of the extensive natural history collection. It is an interesting exhibition with aesthetics and visual impact as a central design context. This is part of the new exhibition paradigm for natural history that is rapidly replacing the didactic and comparative exhibition methodologies of the past millennium. An early pioneer in this area was the Grand Gallery of Evolution at the Muséum national d’Histoire naturelle in Paris, which prompted much effusive eloquence in Stephen Asma’s pivotal work on the culture of natural history museums. Some would say this new movement came to Australia only as recently as 2010 with the exhibition Wild: Amazing Animals in a Changing World at the Melbourne Museum. A small sign near the entrance to Wild Planet addresses visitors with the proclamation ‘Welcome to Life’. This general exhortation, implying that visitors may have no previous experience in this department, is a somewhat overly presumptive, if well-intentioned, generalisation. It does, however, act as a headline for exhibition content that includes the interesting scientific parameters of the conservation status and evolutionary distinctiveness of various extant taxa. This is useful exhibition context that provides two objective, quantifiable axes for the audience to focus their concern. Naturally, a visitor to the exhibition should feel greatest concern for beasts that are highly endangered and evolutionarily distinctive and least concern for those that are common and not very distinctive. For example, the ibis, once revered as a god-like creature, is now sadly tagged with the later dismal, scientific assessment that has stripped it of its divine status and reduced it to a species of human disregard. Such is the slippery slope of anthropocentrism when evolutionary biologists replace the high priests of ancient Egypt. Wild Planet’s message is one of connections and interconnections as well as human responsibility for behaviours that can impact the fate of different lineages; a subtle but strong message about the need for responsible human stewardship of the living world. But the exhibition harbours another interesting message. Avid label readers can’t miss the fact that several of the animals on display have labels indicating their evolutionary distinctiveness hasn’t been assessed. It is also noted that 50 per cent of insect species have yet to be described. The exhibition doesn’t shirk the issue of how little is known and how much more work there is for science to do. This concern was relayed in the new director’s keynote speech in 2015. There is an obvious aspiration to address perceptions of the institution’s reputation as a scientific organisation. Perhaps they don’t now, but there was a time, about a generation ago, when they did. This quote from the exhibition wall gives an interesting insight into the changing nature of the museum as institution, the triumph of entertainment over education, the predominance of audience over collections. It also reflects how difficult it has been for public institutions like the Australian Museum to maintain their scientific credentials. There was some media criticism of this at the departure of the previous director. The new director is keen to reverse this, but a world of efficiency dividends, neoliberal quantifications of audience impacts and a lack of government interest in science means that the restoration of scientific credibility is unlikely to be funded by the public purse. Another new exhibition, Pacific Spirit, is on level two in a space that has been stripped back to its original colonial architecture. Here, some of the extraordinary cultural treasures of the Australian Museum are juxtaposed against the natural history galleries of Dinosaurs and Surviving Australia. 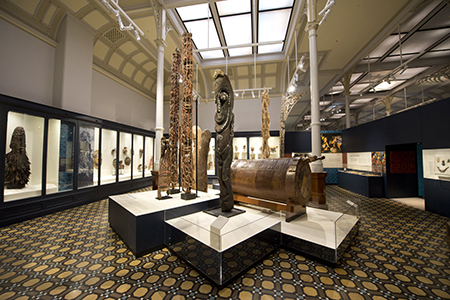 The patterned, tiled floor strangely reverberates with the complex, ornate and mysterious objects on display that include elaborate headdresses made from material of mixed biological origins, wooden and terracotta artefacts and ornate old and new textiles. The Australian Museum’s collections from this part of the world are simply extraordinary. As a colonial museum on the far margins of empire, the Australian Museum harvested the materials of early settlers, scientists and missionaries in this part of the world. There are sacred Malagan masks from Papua New Guinea, which were collected during the early history of the museum; ceremonial poles from New Ireland; carved door panels from New Zealand; bird of paradise head ornaments from the highlands of Papua New Guinea; kava bowls and drums from Samoa; slit drums from Vanuatu; and delicate jewellery, including a necklace made of whale teeth, from Fiji. This museological collision between European and Pacific civilisations, and the combination of architecture and artefacts, causes something of a sensory overload, but one that piques rather than dampens visitor curiosity. The artefacts have simple, structured labelling (purpose, cultural group, and so on). Despite the fact that colour, culture and exquisite artistry infuse every object, many simply record ‘maker unknown’. It is a poignant reminder of how, up until relatively recently, colonial museum practice was essentially acquisitive. The same truths are seen in the labels on many artefacts in the redeveloped First Australians gallery under the curatorial guidance of Indigenous artist, Jonathon Jones. Pacific Spirit is just a small glimpse into the extensive Pacific collections at the Australian Museum. There are ambitions to augment the display with new exhibition work in the future. This focus on the Pacific fits in well with the museum’s new orientation facing the harbour, and the work that the museum has already done in connecting some marginalised Sydney-based Pacific communities with their culture through these objects. For a large, metropolitan cultural institution, doing socially inclusive things in western Sydney gets a tick of approval from NSW state bureaucrats and politicians. Crystal Hall and Wild Planet form stage one of the plan to turn around the fortunes of the Australian Museum and make it the most visited building in Sydney. The new entranceway and a reinvigoration of the natural history displays were completed and operational within the short time of only two years. There are now plans to extend the museum southwards, down William Street, through access to the funds generated by the NSW Government ‘poles and wires’ sale. Apart from extending the reach of the Pacific in the exhibition halls, there are also plans for immersive audience experiences that will be at the forefront of redefining the concept of the museum visit. If the amount of change witnessed in the first two years extends throughout the full term of the new director’s tenure then, by that time, we should be able to say that the museum has been completely turned around. 1 Steve Webb, Matthew L Cupper & Richard Robins, ‘Pleistocene human footprints from the Willandra Lakes, southeastern Australia’, epublications.bond.edu.au/hss_pubs/40, accessed 28 Mar. 2016. 2 Stephen T. Asma, Stuffed Animals and Pickled Heads: The Culture and Evolution of Natural History Museums, Oxford University Press, 2003. 3 Bernice Murphy (ed.) 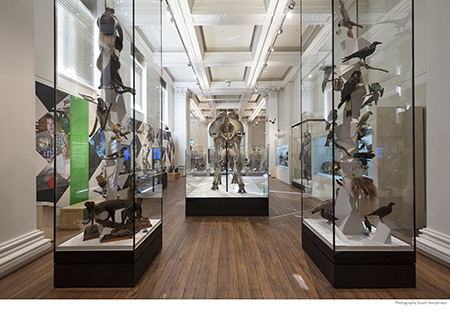 ‘Wild and contemporary – Melbourne Museum’s progressive redevelopment of its long term displays – Australian natural history collections revitalised for new audiences’, Museums Australia Magazine, vol. 19, no. 1, 13–16. 4 Nicky Philips, ‘Australian Museum left with a skeleton staff as tyrannosaurus exhibition opens’, Sydney Morning Herald, 30 Nov. 2013. 5 Frank Howarth & Dion Peita, ‘Pacific Youth Cultural Reconnection Program’, Commonwealth Association of Museums Online International Journal and Archive, www.maltwood.uvic.ca/cam/publications/conference_publications/Howarth&Pieta.2011-05-27%200930%201-3.pdf, accessed 28 Mar. 2016.